Thanks for your interest in Jettson Lure Eyes, and welcome to our product information page. Here you will find everything you need to know about the Lure Eyes, including methods for attaching the eyes, available sizes, the differences in the backings, how to clean the eyes and an overview of the production process. If, after reading this page, you still have questions, please contact us. Our Lure Eyes are made using a process that was almost two years in the making. Many types of printers, glues, backings, films and other materials were combined and tested until we found the perfect combination. It wasn’t easy, but the many long hours of work and drive to succeed payed off. As we explain the process, we have been careful not to reveal any proprietary information regarding the process, materials or methods used. We do provide an overview and general description, with enough detail, to explain the process coherently. 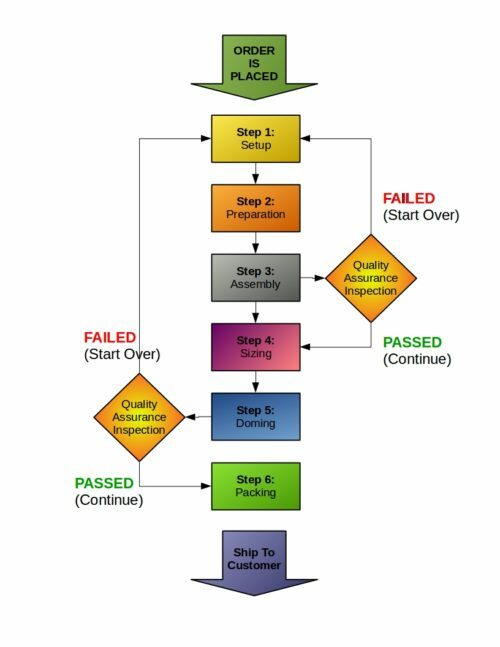 In order to keep up with a busy, and tedious, production process we have developed a six step process. This six step process is implemented once an order for Lure Eyes is received, and is designed to keep the orders organized and produced in a timely manner. As each step is completed, the customer is notified as to the progress of their order. Once the order has been fulfilled, and shipped, a tracking number is added to the order for customer convenience. Setup – The Lure Eye artwork is added to a production sheet layout, then output from a printer. Preparation – The sheet output from step one, and the other base elements needed to produce the Lure Eyes, are trimmed for the next step. Assembly – The base elements, the first four layers of your Lure Eyes, are glued together and will be set aside to dry for 24-48 hours. The drying period ensures that any degassing of the materials is completed before proceeding to the next step. A proper drying period is important because it reduces the chance of bubbles in the domes later in the process. Sizing – Once the assembled base elements have dried, each Lure Eye is hand cut to their final diameter and checked for any defects prior to being placed in the queue to be domed. There are thousands of eyes in the queue, and it usually takes between 4-6 days before the Lure Eyes reach the next step. Doming – This step is where the Jettson Lure Eyes really come to life. Each Lure Eye is individually mounted on one of our special boards and domed with a durable two part polymer. Once domed, the Lure Eyes will dry for 48 hours in a dust free, humidity controlled, temperature monitored case until cured. Once cured they will be inspected for defects and, if the Lure Eyes pass inspection, they will proceed to packing. If a problem occurs, a delay in production will occur.During the curing process there are many variables at play, and once in a while, the Lure Eye domes do not cure properly. If this happens, the Lure Eyes have to be remade. An email notification will be sent and your order will be fast-tracked back in to the order queue. This type of delay will delay your order’s delivery time by 5-7 business days. Packing – Finally, the Lure Eyes are packed and labeled. The Lure Eyes are now ready to be shipped. We hope that his short overview has helped you to understand the process behind the production of Jettson Lure Eyes. All our Lure Eyes are hand made, right here, in the United States of America. Jettson Lure Eyes are currently available in over 180+ styles and designs. Our selection is second to none, and we are continuously adding more designs to our collection. In the near future, we will be providing an online facility which will allow customers to build their very own Lure Eye designs. Jettson Lure Eyes are available in 16 sizes, with more coming soon. Lure Eyes are made using one of four types of backings. Each backing changes the basic look and light reflection of each style of eye. Specialty Lure Eyes may not be available in all backing styles, so be sure to read each description. Pearlescent White – Our most richly colored Lure Eyes are made with a pearlescent white background. The white reflects just a the right amount of light to amplify the eye’s colors and enhances all of its details. Glow In The Dark – The glow in the dark backing transforms from a white/light green tint colored eye, to a bright green glowing eye when placed in a dark environment. To make the Lure Eyes glow, you must expose them to light. The longer the eyes are exposed, the longer they will glow. We also carry an additional 18 colored chrome backings and 2 holographic backings for specialty eyes. From time to time we build up inventory of our best sellers, but the majority of the time our Lure Eyes are made to order. All Lure Eye orders are processed and mailed out in 10-12 business days from their order date. There are times when we encounter delays, due to a number of reasons, so Lure Eye orders may sometimes take longer to produce than our normal turnaround time. If a Lure Eye becomes dirty, for whatever reason, you can clean it using a soft cloth and some rubbing alcohol. Apply the alcohol to the cloth and gently rub until the substance is removed. Do not apply too much pressure, doing so may scratch the eye. Use some alcohol and thin out some non-yellowing epoxy and lightly brush it over the eye. Wait for it to dry and inspect the eye. The epoxy should have filled the scratch and made the scratch invisible or less noticeable. Glue the eye to the lure you are making and apply your epoxy clear coat. The epoxy should fill the scratch on the Lure Eye and make it less noticeable. We don’t guarantee that this technique will work perfectly, and recommend discarding damaged eyes. Unless specifically stated in the description, all Jettson Lure Eyes have a tacky backing. The tacky backing can be used to hold the smaller Lure Eyes in place while gluing or clear coating, but it is recommended that the larger Lure Eyes, 12mm and larger, be glued or epoxied in place. We always recommend that Jettson Lure Eyes be applied using a glue or epoxy so that they do not move while your clear coat dries. Please note the following: If you decide to stick the Lure Eye to your fishing lure, make sure your paint on your lure has completely dried. If not, the adhesive will not adhere and the eye will move. If you are not sure if your paint is dry, please wait at least 24 hours before affixing the Lure Eyes to your lure. Jettson Lure Eyes is a creation of John Kiminas, and came about out of a sheer frustration at the lack of available lure eye choices in the market. It seemed like every type of lure making component was offered in a multitude of variations, sizes and styles, except when it came to lure eyes. The Lure Making Industry forgot about the lure eyes! Being a lure maker, John was always searching for ways to improve his lures, and after some careful research, he decided that the eyes were too important part of the equation to be ignored. Instead of using the same, industry standard eyes that most of the other lure makers were using, he wanted something different. He wanted something that would complement all the hard work that goes in to making a lure, as well as enhance his lures appearance. So, in the fall of 2014, he went on a mission to find better eyes for his lures. Based on the results of his search, and the data compiled, he could only come to one conclusion… He would have to make his own lure eyes. And, that is exactly what he proceeded to do. Until this point in his lure making, the only eyes John had ever created were simply painted directly on to a lure. Literally, a light colored dot with a dark dot for the pupil. To get the type of lure eyes he wanted, he knew he would have to do more research and some learning. John proceeded to methodically scour the Web for images, videos, how-to articles, books and anything else he could get his hands on that explained how to make lure eyes. This process took about 2 months, and when he was done he had a good idea of how to proceed. The next step, start making them. Making the eyes was quite a learning process. He tried all types of materials and techniques. Some worked well, and some did not. When all was said and done, John was very happy with his creations and immediately noticed a difference in his lures appearance when he used the new eyes. His customers noticed the difference too, and so did some of his fellow lure makers. As the next couple of months went by, John sent a few of his fellow lure makers a some of the eyes he was creating. After some feedback, and a few changes Jettson Lure Eyes was born! The first set of Jettson Lure Eyes that were offered were made available by request, and a PDF catalog was used to display the color choices. This was done for a several reasons, the main being, the control over the amount of orders within a particular time period. Since this was a new product, John did not know what the response would be and his production process could only produce a small quantity of eyes at a time. As time progressed, little by little, John was able to scale up the production process to meet the growing demand for the product. He took what he had learned from others, his experiments and his experience making eyes to create an innovative way of producing hand made Jettson Lure Eyes. He perfected the process to a point were he was able to efficiently make 2000-3000 eyes per week with just a one man shop. Confident enough with his progress, he decided list the Lure Eyes for sale on his Web site. The Jettson Lure Eyes product was launched with over 140 styles, 15 available sizes, a choice of eye background, both left and right sided eyes and an adhesive backing. Currently, there is no other place in the world with a larger selection of lure eyes and available sizes. In the future, John hopes to create the largest resource for Lure Eyes in the world.